English muffins topped with ham, provolone cheese, tomatoes and a poached eggs. This is a sponsored post written by me on behalf of Fresh From Florida forIZEA. All opinions are 100% mine. It’s that time of month again with the Fresh From Florida campaign and this month our featured vegetable is Florida Tomatoes! One of my favorite things about living here are all the choices for fresh vegetables at any given time. Tomatoes are just starting to come in now along with zucchini, beets, beans and all kinds of fresh herbs. The local strawberries have been amazing and are still available all of this month. Watch for those Plant City Strawberries in your grocery store. It seems that about anything you could want is at the farmer’s market now. I was there last week and these are just a few of of the vegetables and herbs you could buy this week from the local farmers. I went to a hydroponic garden near me last weekend to go see what’s available right now where I got to talk to the man who owned it. It is interesting to me to see all of the ways people are growing our produce now. I went to get some fresh herbs which I got to harvest myself. You are given a clam shell container and scissors and you can go out and pick what you need for just $3.00 for whatever herbs you can get in the container. Be sure to look for the Fresh From Florida logo displayed in your grocery store, I have been seeing it all over lately. I don’t know about you but I love knowing where my produce is from and didn’t arrive here on a boat from somewhere. Have you been over to the Fresh From Florida Recipes website to see what’s cooking there every month? They feature new recipes every month and I have really enjoyed all the ones I’ve tried so far. When dining out watch for the Fresh From Florida logo on either the menu or on the restaurant window to be assured that what you are eating is the freshest and healthiest you can get. 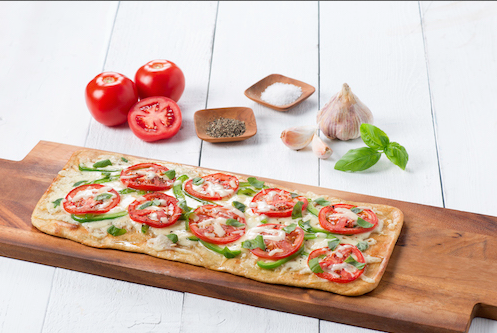 This recipe for Florida Flatbread with Tomatoes and Sweet Peppers is featured right now. You can also follow Fresh From Florida on Fresh From Florida on Facebook and on Fresh From Florida on Twitter. Do you ever get stuck and want something fresh and flavorful for breakfast but don’t know what you want. You should try my Tomato Breakfast Melts. They are so good. I made my own English Muffins because I love how good they are but store bought will work just as well. English Muffins are easy to make and the dough needs to be made the night before. They cook in about 6 – 8 minutes in a pan on the stove. Then all you need are some eggs, ham, provolone cheese and of course some Florida tomatoes. English muffins topped with ham, provolone cheese, tomatoes and a poached eggs. Preheat the oven to 400 degrees. Spray a cookie sheet lightly with cooking spray. Place a few pieces of ham on the top of each half of the English muffins. Top with a piece of provolone cheese. Season with salt, pepper and the Italian herbs. Bake for about 8 minutes until the cheese melts. Top with a poached egg. To poach the egg. Bring a pan of water to a boil. Add about 1/2 teaspoon salt and a tablespoon of white vinegar. Give the water a stir to get the water going in one direction. Quickly drop the eggs into the water. Skim off any foam. Cook for at least 3 minutes depending on how runny you like your eggs. At 3 minutes the whites will be cooked and the yolk runny like you see in the picture. Remove with a slotted spoon to a paper towel. Then add the egg on top of the tomatoes. Increase the recipe as needed depending on how many you are serving. How about some Roasted Asparagus with Grape Tomatoes? Any recipe that calls for fresh tomatoes gets my full attention. Your recipe for Breakfast melts is the best recipe I have seen! Summertime is almost upon us here in FL. I think I am going to start planting some of my own herbs. It was almost 90 today, I am so not ready for it. they started planting here in Feb. I love tomato season and this melt looks like the perfect way to enjoy it. I’ve actually got some dairy-free provolone on hand that isn’t half bad and might work great in this for breakfast tomorrow! Thanks Alisa! Hope you enjoy it! Gorgeous photos! That egg looks perfect – this is a great breakfast melt! Pretty jealous that you get good tomatoes now 😉 These look pretty amazing though and just look at that yolk! After living in the north most of my life I am amazed at what we can get fresh right now. To me the combination of eggs, cheese and tomatoes is magical. This looks great!! Mine too! thanks for stopping by…. These look great. My family loves poached eggs and English muffins. Adding the cheese and tomatoes is great. You need to make the homemade muffins Rachael, they are almost an eazypeazy recipe. Wow, what a delicious looking breakfast. Florida has some good looking tomatoes! We sure do! The markets are amazing right now. What a gorgeous looking breakfast melt! I’m ready for some good and tasty tomatoes up here in Ohio! Wish I could share! It won’t be long before you can get them. I am so jealous that you have such a great farmer’s market right now!! This looks like my ideal breakfast! LOL I am jealous of your dad’s finds! we’re even. This is my kinda breakfast! Love poached eggs – yummm!! Very cool about the herbs. Wish we had a place like that closer to me. I love that place for the herbs. They have all kinds of other vegetables too. It is really cool!